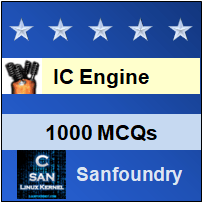 This set of IC Engines Multiple Choice Questions & Answers (MCQs) focuses on “Requirements Of Ignition System”. 1. The function of the ignition system is to _____________ the flame propagation process. 2. The total enthalpy required to cause the flame to be self sustaining and promote ignition, is given by the product of the surface area of the spherical flame and the enthalpy per unit area. 3. A spark can be caused by applying a sufficiently low voltage between two electrodes separated by a gap. Explanation: In fact, a spark can be caused by applying a sufficiently high voltage between two electrodes separated by a gap. Explanation: An ignition process obeys the law of conservation of energy as energy is only produced there. 5. The pressure, temperature and density of the mixture between the spark plug electrodes have a considerable influence on the __________ required to produce a spark. Explanation: The pressure, temperature and density of the mixture between the spark plug electrodes have a considerable influence on the voltage required to produce a spark and mass and current are dependent on voltage. 6. If the spark energy exceeds 40 mJ and the duration is longer than 0.5 ms, reliable ignition is obtained. 7. If the resistance of the deposits on the spark plug electrodes is sufficiently high, the loss of electrical energy through these deposits may prevent the spark discharge. Explanation: As air is poor conductor of electricity, due to this an air gap in an electric circuit acts as a high resistance and conductor and ignition are required before conduction. 9. A spark is produced to ignite a homogeneous air fuel mixture in the combustion chamber of an engine, it is called spark ignition system. 10. An ignition system should provide a good spark between the _____________ of the plugs at the correct timing. Explanation: An ignition system should provide a good spark between the electrodes of the plugs at the correct timing as only electrodes are used in ignition system and cathodes and anodes are used in battery. 11. An ignition system should function efficiently over the entire range of engine speed. 12. An ignition system should be heavy, effective and reliable in service. Explanation: Actually, an ignition system should be light, effective and reliable in service. 13. An ignition system should be compact and easy to maintain. 14. An ignition system should be cheap and convenient to handle. 15. The interference from the low voltage source should not affect the functioning of the radio and television receivers inside an automobile. Explanation: In fact, the interference from the high voltage source should not affect the functioning of the radio and television receivers inside an automobile.